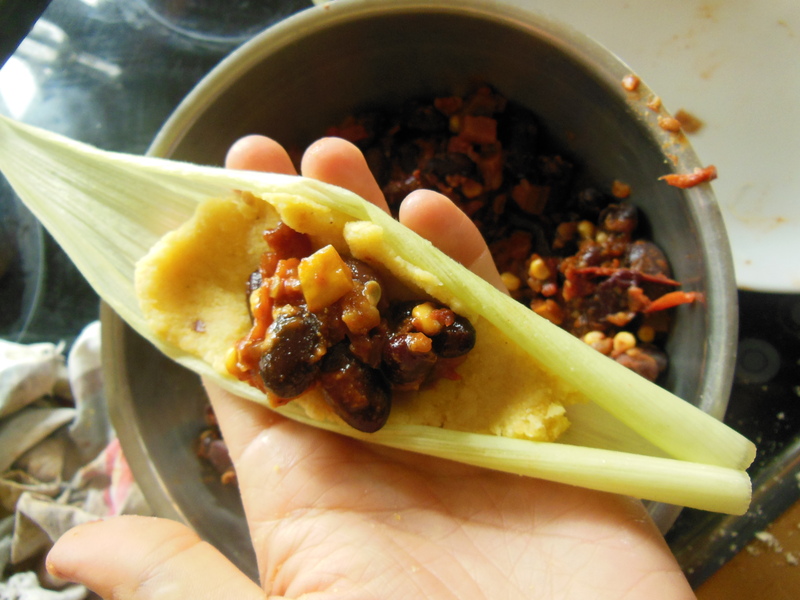 Tamales are the South American equivalent of a sandwich, dating back to Aztec and Mayan times. 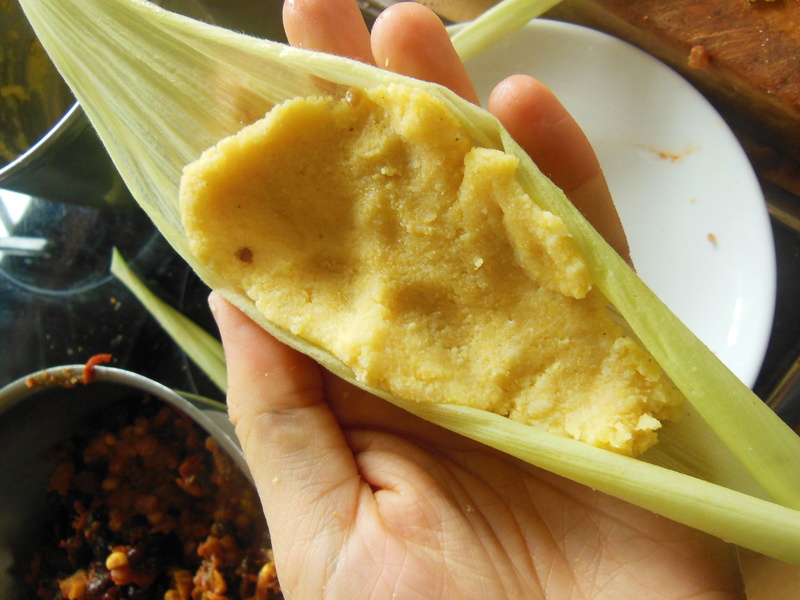 Soft cornbread stuffed with just about anything, wrapped in corn husks and steamed. I always dreamed of making a vegan version of tamales since I saw Jamie Oliver do a meaty version. It’s best to make this recipe when corn is in season – save the husks from previous meals and soak in water for a couple of hours to soften. 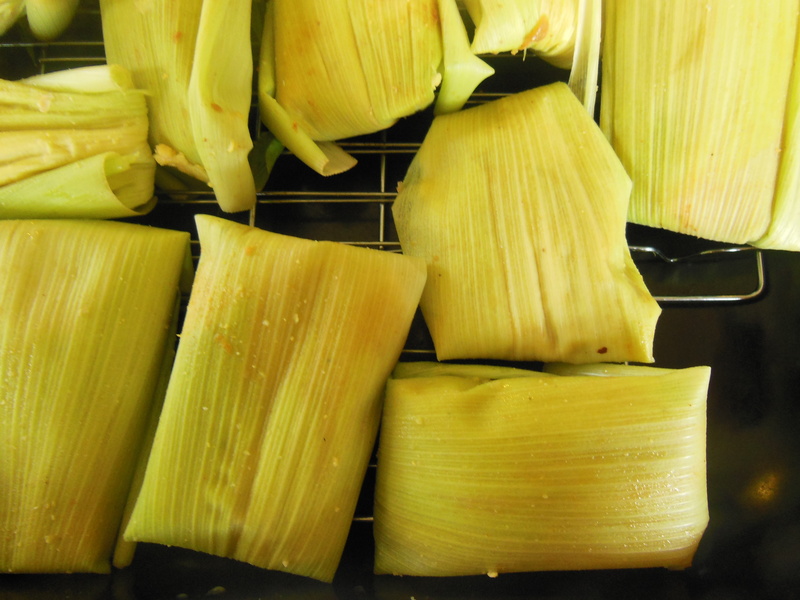 You can also buy husks in packets, or use banana leaves. Don’t be scared about making them, have fun and get your hands a little messy! Add molasses, beans, liquid smoke and stock cube. Carefully remove husks from corn and set aside, slice corn from cob, and add to mixture. Cover and simmer for 20 mins. Taste and season with salt and pepper. Bring stock to the boil, remove from heat and add salt, oil, masa and polenta. Mix well and allow to cool slightly. Prepare a steaming dish- I use a deep oven dish with metal cake cooling racks in it. This allows you to fill the base with boiling water and sit the tamales on top of the wire so that they are not immersed in water but get steamed. Alternatively for an easier option you can just steam them on your standard stove top pot steamer. Open up 1 corn husk leaf and press about a tablespoon fill of the mixture into it so forms a half cm thick square (see above photos), Place a dollop (2 tsp) of bean mixture on top and then top with another flattened piece of the dough, roll up sides of dough and pinch together so none of the bean mix can leak out. Wrap edges of husk around mixture and fold into tight parcel; you may want to wrap another husk around to be sure you don’t get leakage. Place the folded tamales onto steaming rack and then fill bottom of dish with hot water (making sure water line is below the packages). Tightly cover with aluminium foil and bake for 50 mins. 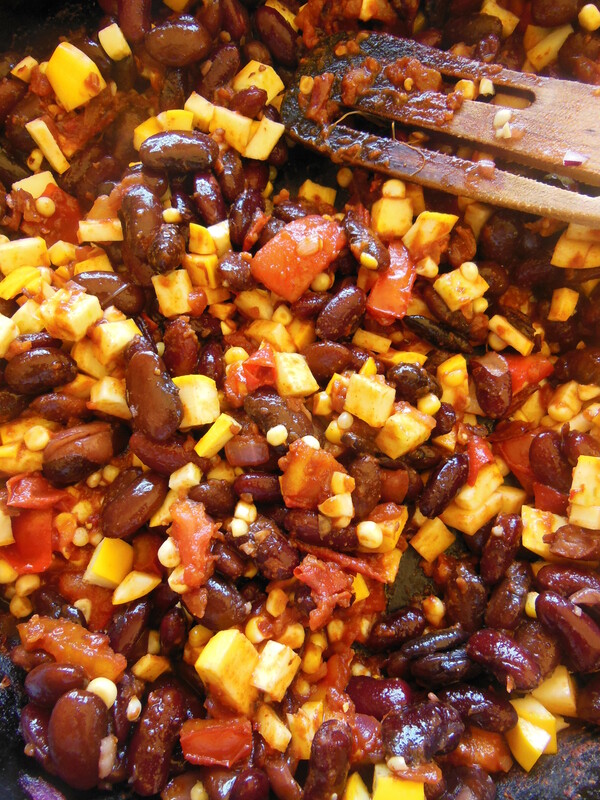 There will be extra bean mix left over which you can heat up and serve on the side. Remove from oven and serve immediately with Salsa and Guacamole (make sure you tell people unwrap from the husks before eating). Enjoy!!! !